Sunderland boss Sam Allardyce says his relegation-threatened Premier League side may need divine intervention after their goalless draw with West Brom. The 61-year-old added: "In normal circumstances it would have been two or three-nil - if we had not had the unbelievable Ben Foster in the opposition's goal." Baggies goalkeeper Foster pulled off a string of fine saves, including three from Jermaine Defoe. "There had to be four or five outstanding saves from Foster - not just one or two," ex-West Ham manager Allardyce added. "Of course we could have been a bit more clinical with our finishing as well - but that's being very nit-picky. "It's a cruel blow on the basis of the position that we're in - in such desperate need that we are for points. "It's the best performance we've had since I've been here, but it was one point again not three and Norwich get that little bit farther away." The draw leaves Sunderland in 18th position, four points adrift of 17th-placed Norwich and safety. However, they have one game in hand on the Canaries and face them at Carrow Road on 16 April. Next up for Sunderland are league leaders Leicester at the Stadium of Light on Sunday. 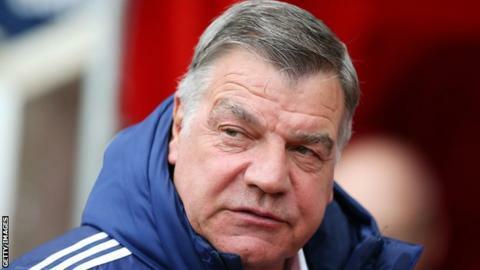 "We look very good at dealing with the pressure at the moment and I hope we can turn great performances into victories very shortly," Allardyce added. "I want us to beat Leicester next week. Let's go and upset the apple cart, hopefully play like this and beat them."